THE ONLY VERSION OF THE CLASSIC PUZZLE EFFECT THAT APPEARS TO BE A NEAR TEST CONDITIONS IMPOSSIBILITY. The method used in Puzzled is completely original with Bob Cassidy. It is based on an "out-of-left-field logical disconnect" that will positively fool anyone who sees it. The effect is simple and direct - an easel, covered with a large cloth - stands on the stage. A spectator is handed a boxed jigsaw puzzle which, when assembled, will be a complete map of the United States. There is a separate piece for each of the states. She freely selects a puzzle piece - any State - from the box and holds it up for the audience to see. The mentalist removes the cover from the easel and a completed puzzle is seen, mounted on a large mat. It is, the performer explains, 'almost' an exact duplicate of the boxed US Map puzzle that was given to the spectator. He says 'almost' because the assembled puzzle on the easel has one piece (one State) missing. Wouldn't it be an amazing coincidence if. . . .? The piece the volunteer has been holding up for all to see is the very piece that is missing from the mounted puzzle! While Bob's version of the effect was inspired by Romark's creation and is similar in effect, the resemblance is purely superficial. Any well versed mentalist or magician could, upon seeing Romark's or the later Mona Lisa version, easily work out a method. And the chances are they'd end up forcing a puzzle piece. Unfortunately - there are more than a few intelligent laymen who would arrive at the same conclusion. The spectator is handed THE OPENED PUZZLE BOX and is asked to look at the the pieces before freely selecting one. 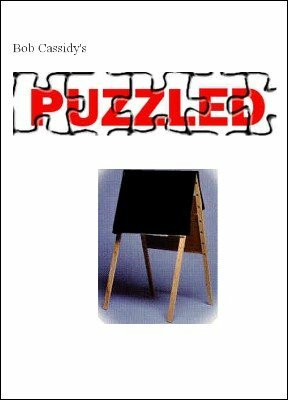 ONLY TWO PUZZLES ARE USED - ONE IN THE BOX AND ONE PERMANENTLY MOUNTED AND DISPLAYED ON THE EASEL. THESE ARE GENERIC PUZZLES THAT ARE AVAILABLE ANYWHERE. That's right - the volunteer (whom the performer has never met before - there is absolutely no preshow work, secret cueing or confederacy involved) LOOKS AT THE PIECES AND SEES THEY ARE ALL DIFFERENT BEFORE SELECTING ANY ONE. The performer can be standing with his back turned if he so desires. It is a one-man routine and can be performed anywhere and completely surrounded. No specially prepared puzzles are required. You can use any puzzle you like. The easel is unprepared and there is only one puzzle mounted on it beneath the cloth. There are no furtive moves - everything is perfectly clean and direct and - best of all - Puzzled is practically self-working! Everything you have just read is true. The method fools everyone. More significant to the working pro, however, is the fact that it is clean-cut and direct. And the routine is not only amazing - it is extremely entertaining as well. Most important of all is the fact that it is exclusive. You won't see Puzzled being hawked all over the Internet and on display in every theme park or Vegas strip "Magic shop". That is all we can say here. The rest you will find in Puzzled. 1st edition 2005; 18 pages.